Heard of the $25,000 chocolate sundae? No? I love chocolate sundaes but this doesn’t look very enticing to me. I’d rather go with the McDonald’s sundae. 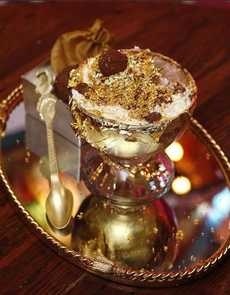 The â€œFrrrozen Haute Chocolateâ€ debuted on November 7th at a New York restaurant called Serendipity-3. 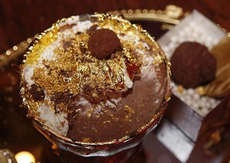 The “dessert” is infused with 5 grams (0.2 ounces) of edible 23-karat gold, (WTF? I had to look this one up, I know there’s lots of strange things people eat, why not edible gold) and is a blend of 28 cocoas, including 14 of the most expensive and exotic from around the world and is served in a goblet lined with edible gold. At the base of the goblet is an 18-karat gold bracelet with 1 carat of white diamonds. Topped with whipped cream and guess what!? Yes more gold and a side of La Madeline au Truffle. This entry was posted on Friday, November 9th, 2007 at 2:44 am	and is filed under Food. You can follow any responses to this entry through the RSS 2.0 feed. You can skip to the end and leave a response. Pinging is currently not allowed.